I have finished painting the 82nd Platoon of the Iron Army of the 14th Grand Company. Some of you BoLS viewers may recognize the command squad as it was entered in their hobby challenge. Thanks for those who did vote for me, really I just entered the challenge to give an example of what is possible with the great plastic kits GW produces and to get any feedback from the community their. This is the 82nd platoon command of the Iron Army of the 14th Grand Company led by Tiresias the Lost. Tisesias was a small boy when the 14th conquered his world and as the Warsmith strode upon the field of victory, Tisesias was brave (or foolish) enough to not look down. The Warsmith had him immediately blinded and promoted to the lead the 82nd platoon. He is accompanied by Niles the Unspoken, who is required to be gagged or else will continue to scream blasphemies until he passes out. These are the two troop squads with a basic setup of a vox, flamer and Sargentwith a power weapon. I like the imaginary of the Sargentwhipping his subordinates into action with his flail. I know there are some major gaps on the Catachan models between the torso and the arms but since I’m going for the full look of the army, I’m not too worried about some of the “floating arms.” Maybe in the future I’ll go back and putty the joint and repaint it, but at this point I’d rather spend my energy painting the other platoon, company command and the many other things I need to add to this army. 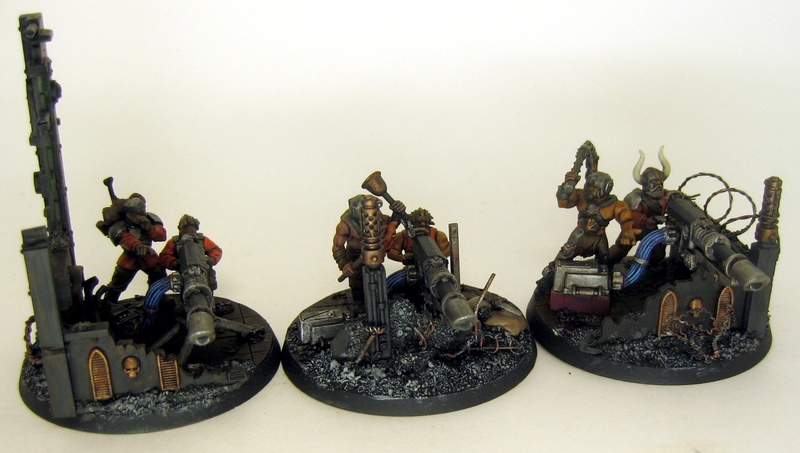 Two lascannon squads as my anti-tank support, and don’t fret, the heavy weapon teams in platoon two are missiles and mortars, I just decided to paint the lascannon teams first. The heavy weapon teams are not completely done, I still need to finish the base and a few minor highlights but I had the camera out and want to get the pictures up. My light box is not large enough to fit the full platoon so I am going to have to wait until I bring them in the FLGS to get some in-action pictures. Next up is to build the four sentinels that came in the mail a few weeks back then paint platoon two. 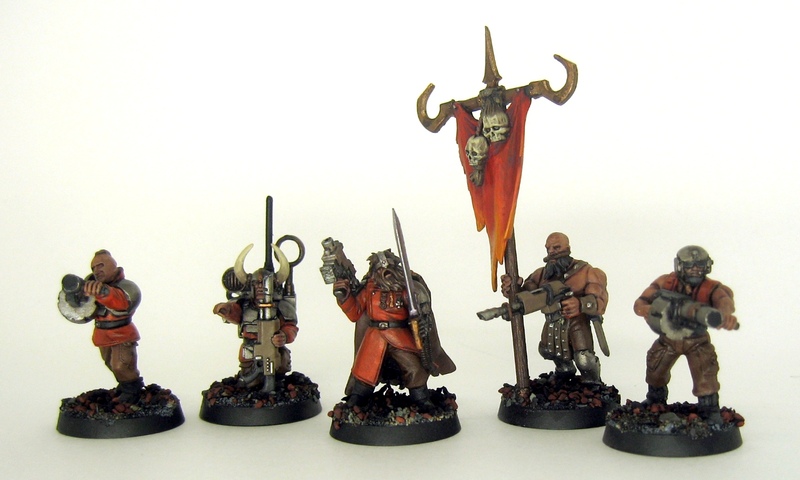 Repainted my Khorne Berserkers may jump in line though, as there is another 1500 pt tournament at the GW store and they were the only squad that wasn’t painted well. ~Update: So I just realized that instead of posting the second lascannon squad I posted the first one twice!